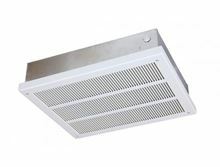 Qmark Electric Ceiling Heater with Fan at 150 cfm - 347 volts and 4,800 Watts - EFF4803. QMark’s high-capacity, heavy-duty fan-forced ceiling heaters are designed for use in commercial, industrial or institutional applications requiring electric fan forced heaters. They perform exceptionally well in such applications as entry ways, hallways, restrooms, stores, detention environments and similar large areas. These heaters will accommodate pneumatic/electric or low voltage controls commonly used with computerized energy management systems. The 1/4 inch mesh screen deters insertion of foreign objects.